It was after noon when we left Danvers, Massachusetts and headed for Salem, just a few miles away. That’s when we learned that Salem is awash with tourists, angled streets and odd traffic patterns. The combination left me frazzled by the time we found a car park. The cure for the frazzles: food and drink. So the first place we stopped when we got to the Peabody Essex Museum: their outdoor cafe, where we had a lovely lunch that fueled us for the afternoon. We ate at several museum cafes on this trip and I must say, the quality of food at museums has improved immensely of late. 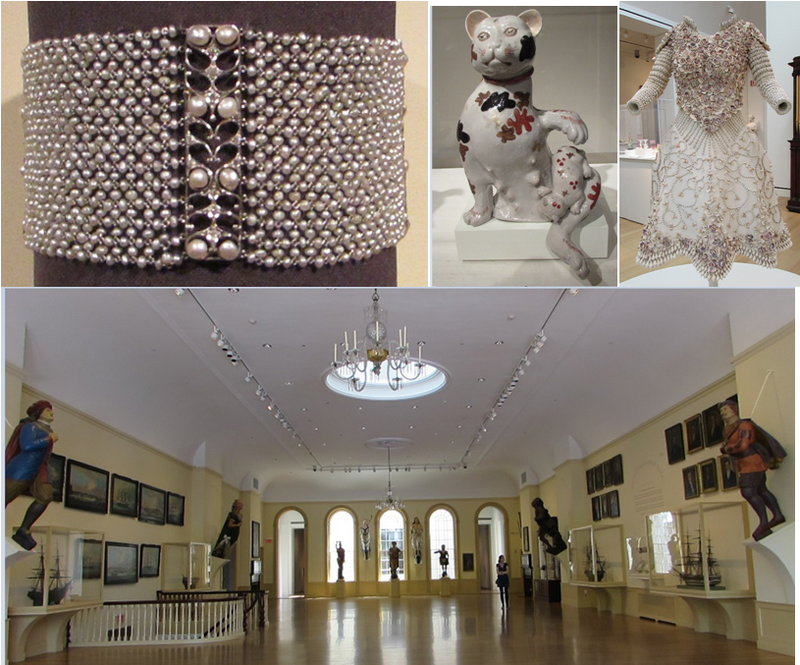 The Peabody Essex Museum started in 1799 as the East India Marine Society, an organization of seafaring folk who decided to create a place to display “natural and artificial curiosities” that they had brought back from their travels. Parts of their collection still have an 18th and 19th century Asian or shipfaring focus, but there’s also everything from gilded age jewelry to a modern seashell decorated bridal dress. After the Peabody came our only witch trials related foray in Salem: a visit to the Salem Salem Witch Trial Memorial, which is located directly behind the museum. The National Endowment for the Arts funded a contest to design the memorial, for the 300th anniversary of the witch trials. The Washington State team of architect James Cutler and artist Maggie Smith created the winning design, which consists of a U-shaped stone wall, out of which protrudes 20 benches. The wall is inscribed with quotes from the victims, protesting their innocence, and each bench is inscribed with the name of one of the witch trial victims – the 19 who were hung and one who was pressed to death during a torture session to make him confess – and the method and date of his or her execution. Cutler explained in a 1992 New York Times article: the benches represent tombstones, since most of the victims were buried in unmarked graves, and locust trees planted there represent the trees from which the victims were hung. It’s all very beautiful and quite grim. I’m not sure I agree with the addition of the method of execution. It seems more sensationalist than necessary. The memorial was dedicated by Elie Wiesel in August 1992. Next to the memorial is the 17th century Burying Point, the oldest cemetery in Salem, where several of the witch trial judges are buried. It’s no coincidence that the memorial is located next to the cemetery. The memorial extends to the cemetery, the dead representing the people who stood by mutely while the whole thing happened. 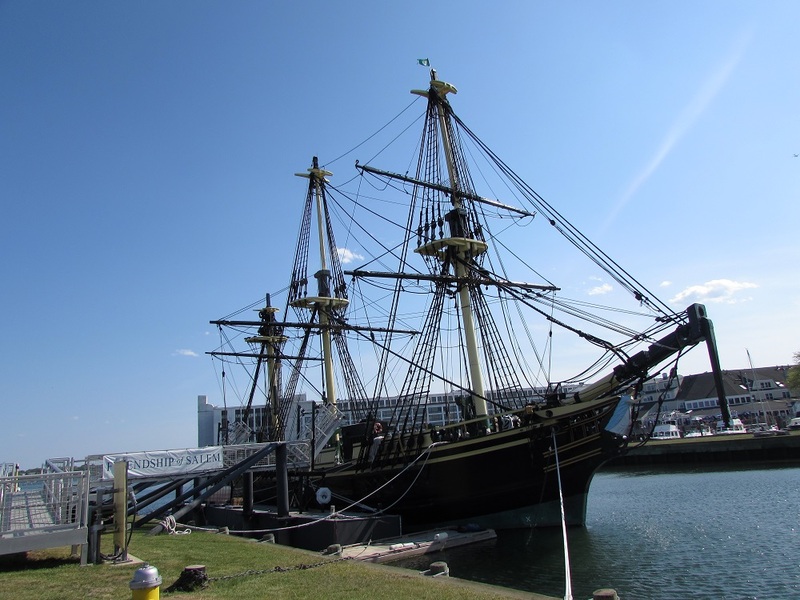 By the time we left the cemetery, it was late afternoon and the other venue I wanted to visit – the Salem Maritime National Historic Park – was closed. We walked the few blocks to the park anyway, to see the exterior of the 18th century merchant vessel Friendship and sit in the garden of the 1762 Derby House. The ship, the house, and several other houses/buildings that are part of the national historic park are available to tour. But for me, that would have to wait for another trip. Gallery | This entry was posted in Massachusetts and tagged Peabody Essex Museum, Salem Burying Point, Salem Witch Trial Memorial. Bookmark the permalink. Tons to do in Salem — will make sure I have at least two days the next time. Just seeing the witch trial memorial is worth the trip. It’s evocative in a way that, in my opinion, the more pedestrian memorial in Danvers is not.